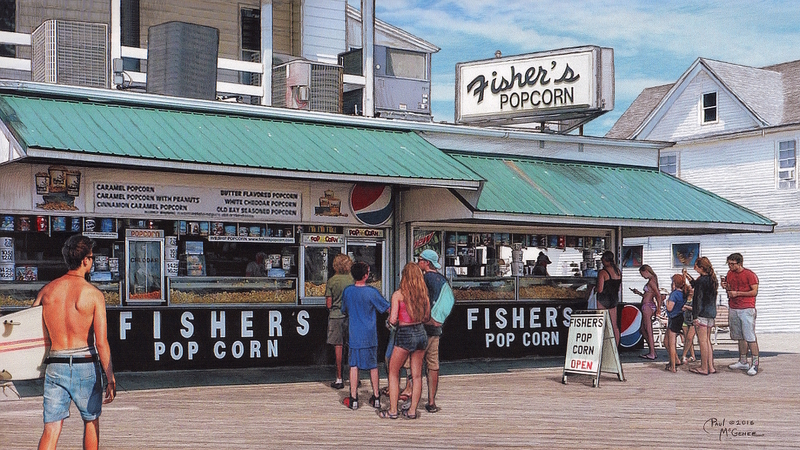 "Fisher's Popcorn" by Paul McGehee depicts the famous Ocean City, Maryland boardwalk popcorn stand on a sunny summer day. Now in its fourth generation of family ownership, the original Fisher's Popcorn stand bagan back in 1937 at the corner of Talbot Street and Boardwalk as Pixton's Popcorn. Everett Fisher and Edmund Pusey had a great concept from the beginning...nothing but the finest, all-natural ingredients were to be used for their delicious popcorn and kettle corn. Named after Mr. Pusey's wife, it later became known as "Fisher's" after Pusey's eventual departure from the business. Everett himself ran the stand for many years, offering up varieties of popcorn slathered in such tasty treats as caramel, cheese, coconut, walnuts and hot-butter. The delectable popcorn was prepared in giant copper kettles back then, a time-tested method still in use today. Nothing is nicer than walking down the boardwalk listening to the surf and the gulls while you enjoy a bucket of Fisher's Popcorn! If you wish to read more about this longtime Ocean City family business, their website is fisherspopcorn.com. "Fisher's Popcorn" is faithfully reproduced from Paul's original color pencil drawing as an archival quality print issued in a strictly limited edition of only 2,000 pieces each hand-signed by the artist.